Yanyan Liu, of TCi partner organization International Food Policy Research Institute (IFPRI), and Klaus Deininger, of the World Bank, are currently conducting research on the poverty and welfare impacts of one of India’s largest public works programs, the National Rural Employment Guarantee Act. They share some initial findings from their research in this guest post. Public works programs are gaining in popularity as governments seek more effective ways of battling extreme poverty and gender-based income inequality. Establishing such programs as a type of social safety net allows governments to set balanced wages while at the same time investing in infrastructure that will further their country’s economic growth down the road. In 2005, the government of India passed the National Rural Employment Guarantee Act (NREGA), which was enacted to provide at least 100 days of guaranteed wage employment in every financial year to every household whose adult members volunteer to do unskilled labor. However, like many public works programs, NREGA is bound to face challenges in the form of high administrative and logistical requirements and potential corruption. Evaluative research looking at the effectiveness of this program sought to determine if NREGA’s benefits outweighed its potential pitfalls. 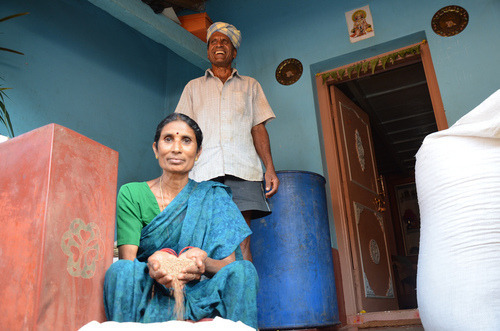 To this end, our recent International Food Policy Research Institute (IFPRI) study in collaboration with the World Bank and International Initiative of Impact Evaluation (3ie), looked at the impact of NREGA on the short- and medium-term welfare and poverty effects of participating communities. Using a three-round, 4,000-household panel in Andhra Pradesh together with administrative data on NREGA participation, the households were randomly sampled from five districts in Andhra Pradesh in 2004, 2006 and 2008. We find that the program is well-targeted in Andhra Pradesh and has had impacts higher than the amount of the program’s direct cash transfer. While short-term effects are higher in terms of participants’ nutritional intake, in the medium-term we see increased accumulation of non-financial assets. Both short- and medium-term benefits seem to accrue more to participants in the scheduled castes and tribes, as well as to those who would otherwise rely on casual labor. Importantly, we do not find evidence that the NREGA program discourages other forms of employment, as program critics have often suggested. In fact, we find that in Andhra Pradesh, increased expenditures on the NREGA program translate almost directly into an increase in additional employment opportunities. Our results also suggest that investments in land improvement are occurring on participants’ fields. This finding suggests that NREGA is likely to have a long-term effect on land productivity. While our findings suggest that NREGA does have significant positive impacts, it must be noted that this study looked at one of India’s better-performing states. Further studies should expand this research to look at other states with weaker implementation records; this would allow researchers and policymakers not only to better understand the program’s overall impacts, but also to identify specific implementation strategies that would improve the program’s success rate throughout the country as a whole.